Sunday afternoon I checked my frustrations with LA holiday traffic and other 30-year-old woman woes at the movie theater door. I channeled the 7-year-old girl inside of me who used to parade around her house in a white-sequin tiara and a flower girl dress she outgrew. That day, I was ready to go on this magical journey to New Orleans. Finally, a black Disney princess. Finally, an American princess. Finally, The Princess and the Frog. You can't help but fall for the heroine. Tiana (Anika Noni Rose) is beautiful and embodies the American dream. She's a hard working girl, taking on a few waitress shifts to help fund her and her father's dream of owning a restaurant. She believes in the American principle "with hard work comes success." Tiana isn't like other Disney damsels waiting for Prince Charming to rescue them (sorry Cinderella). 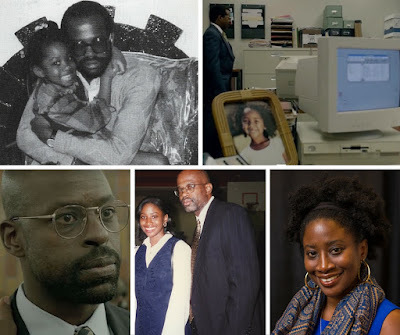 For Tiana, men can wait. Business comes first. This is completely opposite of Prince Naveen's (Bruno Campos) life philosophy. The spoiled, lazy royal is cut off from mommy and daddy's fortune. He travels to New Orleans looking to marry a rich woman (Now I ain't sayin' he's a gold digger...). Instead he meets the Shadow Man (Keith David), an evil Voodoo doctor, and is turned into a frog. Tiana gives the froggy Naveen some sugar to break the spell, only to be turned into one herself. During their lily pad adventure, Naveen shows Tiana it's okay to make room for love and fun in her life. While she teaches Naveen the gift of responsibility and independence. I love Tiana for her determination and heart. I love her because she's a woman from a lower-class neighborhood with a lot of class. I love her for being a good daughter and a big dreamer. I appreciate how her character redefines the notion of "princess" through her independent spirit. The little girl in me loves Tiana because she looks like me. Full lips, wide nose, brown skin just like me. Tiana could be my mother, my little sister, a friend, a cousin, you. I was so proud of her image I teared up. I couldn't help myself. As a black woman, I've wanted to see a movie like this for so long. Media are powerful whether we like to admit it. Images have an effect on how individuals see others and themselves. 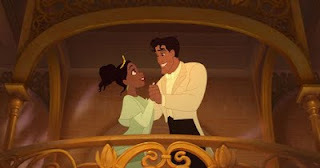 I was absorbed into the storyline but I still had my racism/sexism radar on and Princess Tiana passed the test for me. I enjoyed the film. However, it does not wow me like Beauty and the Beast or Lion King. The writers should have given Voodoo Priestess Mama Odie (Jenifer Lewis) more scenes. She is so much fun to watch. The face off with the Shadow Man is not very climactic, compared to suspenseful villain showdowns from movies like The Little Mermaid or Sleeping Beauty. But the Shadow Man is wonderfully sinister and creepy. I liked how Disney writers made New Orleans a central character. The movie tries to represent the soul of the city with bright colors, food, people and of course music. Jazz and gospel gave vibrancy to the story. The charachters' Southern accents made the setting feel more authentic. One of the shining co-stars is Tiana's friend Charlotte (Jennifer Cody). She is a wealthy socialite and obsessed with finding a prince. She is hilarious and reminds me of a girlfriend always on the prowl for a man. We all know someone like Charlotte. 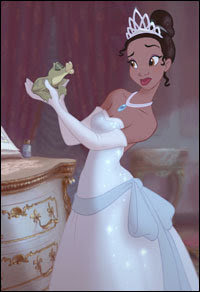 I am disappointed Tiana stays a frog most of the movie. I wanted to see more of her pretty face and poise, but Disney made the amphibian storyline work. She and the frog prince are able to see past their slimy bodies and fall in love. True to Disney canon, we're reminded to love someone for what's on the inside and not the exterior. I relearned that lesson during the movie because I had prejudgments about the Bayou firefly Ray. 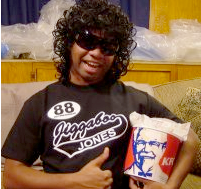 His missing teeth and ragged whiskers screamed "coonery" when I first saw pictures of him on the web. I had a change of heart during the film. The snagga-tooth insect is adorable. I still think the Disney artists should have given the brotha a dental plan, but Ray is one of my favorites. This a fun movie for the young and old. Although Disney is one of the largest media companies in the world, save some of your bootleg money for popcorn. Brave the cold and take the kids to a matinee. It's worth the fun and Disney magic in a theater is priceless. Speaking of Disney magic, true story, my mother told me she opened her front door yesterday. There was a little frog sitting on her porch. How did a frog end up in the hood in East Oakland? Either this was a coincidence or Disney is taking their marketing to another level. In case you're wondering, my mom didn't kiss it. If you saw the movie, SPEAK YOUR MIND and share your opinion. Thanks Kade. After you see it let me know what you thought. This is the first time they featured black princess, and she is pretty!